It was another doozy of a week. But we are trying to shift our perspective and not dwell on the negative. Anyway, I am grateful for another weekend with my family! We have landscaping projects on the to-do list, and I am honestly looking forward to them! I’m also helping my cousin get ready for her senior prom! Today I am linking up with April, Natasha, and Christina; Karli; Erika, Narci, and Andrea for Five on Friday, Oh Hey Friday!, and Friday Favorites. I am also linking up with the group from High Five for Friday. Thank you for inviting me, Bright on a Budget! ONE: If you are attempting to eat fewer grains, have to eat gluten free, paleo, or lactose free, really, I highly recommend this book by Danielle Walker. I think I have mentioned it on here before, but I have pulled it back out recently. I have a blog post planned with some of the recipes I have tried recently. Our internet cable was cut this week, so I’m a bit behind on blogging. I should be able to post that this weekend. I wanted to share the link to the book today. She also has some other cookbooks and a great blog! Danielle changed her eating habits years ago because of an autoimmune disease and her life changed for the better. Her full health story and transformation can be found on her blog in the FAQs section. TWO: I am starting to gather some ideas and pieces for our nursery. We will find out if we are decorating for a boy or girl soon, but I want the room to be relatively neutral either way. I love this crib skirt (not the sheets) from Pottery Barn Kids! And this rams head from etsy? So adorable – especially because we are UNC alumni! I originally saw it on Merrick White’s instagram. I also have a Pinterest board with ideas for the new baby’s room. THREE: Because of a change of plans, Todd and I were able to get away for a dinner date last night. After a stressful week, it was needed! We tried CO (Vietnamese noodles and sushi) and we loved it! I would highly recommend going. They also have a separate gluten free menu with plenty of options! I had shrimp spring rolls and beef pho. Todd had steamed buns with pork belly and a ramen bowl. FOUR: These nail colors are on my wish list: Essie Off Tropic; Essie Hubby for Dessert; OPI Let’s Be Friends. I searched for the OPI color last night, but I couldn’t find it. I think it is one my cousin has used and I loved it, and I’ve also seen it several places on instagram. Ordering that one soon! And I did purchase Off Tropic…I think it will be great for summer pedicures. I included a picture of Hubby for Dessert that I found on Pinterest. You can never have too many neutral nail polishes, right? FIVE: [excuse the language] This quote by Elizabeth Gilbert really motivates me and reminds me of some of the incredible women in my life who I admire. One reason I love social media is because it is an avenue to see so many women doing amazing things – whether they are stay at home moms, moms with careers outside of the home, creative leaders, teachers, examples of health and fitness, women battling infertility and other health issues, women with children who have sicknesses or disabilities, Christian writers, and just women handling everyday problems with grace – there are numerous instagram accounts and blogs with women I admire. They are handling problems when things go wrong, and overcoming daily obstacles. I want to be more like this. These words were exactly the reminder I needed this week. Thank the lord for online shopping. Am I right?! I currently have some wish list items for the home, gifts, and my closet, plus some items I’ve recently purchased that I wanted to share. This is quite a random list! First of all, how cute is this front door mat? I love it, and am planning to purchase it soon. We don’t have a mat for our front door, and we wanted something welcoming and whimsical. I have to confess, I am really not ready to purchase too many maternity clothing items. But I can barely fit into my jeans and shorts. So my plan is to wear dresses all summer! This plan may not work, but I am going to attempt it for now. Old Navy had half off all of their dresses over the weekend, and I purchased several in a size up. Most of their dresses are marked down, plus you can take an additional 30% off your purchase! I am really crushing on these bags from Asos. They could make cute Mother’s Day or birthday gifts, too! The back pack is one that I may have to pull the trigger on. I am currently using a purse from about 3 years ago that is seriously worn out! How cute would that pineapple pouch be to add to a beach bag? It would be perfect for keys, lip gloss, and your phone! The floral embroidered one is more than I would pay, but it is just so pretty that I had to include it. I LOVE the pom pom detail on the colorful bag – fitting for the beach or pool. I am on the hunt for a statement ring to wear on my right hand. That isn’t terribly expensive. I tend to wear the same jewelry repeatedly, and something like this would give me some nice variety. Plus it’s only $35. This sweater from LOFT immediately stuck out to me recently. I, along with my mom and my cousin, are just drawn to fringe. Especially in this color. It could be dressed up or down. This is an extra 60% off right now!!! Don’t worry – I will certainly not buy everything on this list. But sometimes it’s fun to “window shop” and add things to your shopping cart! My mind is all over the place lately. My neighbor texted me this morning and asked what we had going on this Monday morning. I said “I’m trying to focus and work on about a million projects.” She said “Focus? What’s that?” Haha, exactly! If I wasn’t expecting, I think I’d over-do it on coffee today. At least our weekend was productive! We spent a lot of time working in the yard and made a couple of home decor decisions. Home improvements are always so rewarding. I am not planning to do bump/pregnancy updates, but I did snap a picture before running errands on Friday. I looked rough, but this does show my bump. This is kind of an embarrassing picture…keeping it real around here! I was 15 weeks on Friday. And this is deceiving – by the time I go to bed, I look huge! We will find out if we are having a boy or girl in a few weeks! Eek! Though I still have some “morning” aka afternoon/night sickness, I am feeling much more energetic lately! I am not craving my typical diet, but I have loved salads lately. And I have been buying and eating fruit in bulk. We’ve been eating fewer grains and dairy, but I’ve had some days when I just couldn’t do that. If I’m nauseous, sometimes vegetables and chicken just won’t cut it. I rarely eat dairy, unless burrata is an option, and I haven’t been cooking with any butter – baby steps! I’ve also tried making some paleo alternatives to foods we love. I will post those recipes and details later this week. Todd brought home these flowers the other day, just because! On Saturday, we were finally able to celebrate my sweet sister-in-law, Ginna. She turned 30 recently, so Davis and I made her a “29 Again” cake! I wish we had gotten a picture while we were out with them! That’s all for now! I’m off to work on that never-ending to-do list, and do my best to make this my Monday mantra. I tend to be a tad over-dramatic when it comes to food. Just ask my husband! It is nearly impossible for me to make a simple turkey sandwich or anything plain – dishes can always be better. I think it drives him crazy sometimes, but at least our meals are rarely boring! When I tried burrata for the first time recently – WHY did it take me so long to try this life-changing cheese?!?! I really must get out more! – I knew I needed more and I needed it a.s.a.p. (ahem, drama)! Anyway, we had it at a restaurant recently with some prosciutto and I was hooked. I found some at the grocery store, and while we were at the beach last weekend I incorporated it into a caprese salad. I may never again make a caprese salad with plain old mozzarella. Burrata is the way to go! My attempt to eat less dairy is futile when burrata cheese is available. It is a type of mozzarella with a creamy center. If you haven’t tried it, do not hesitate! In Italian it means “buttery” or “buttered.” The outside is like mozzarella and the inside is creamy, so when you cut it open, the texture is divine. This article from The Kitchn tells the difference between mozzarella and burrata, in case you aren’t familiar. Next time you see it on a menu, you should definitely order it. I’m going to stop gushing now, and get on with the recipe. I put together a simple, yet pretty and delicious caprese salad. It really was straightforward, but it presents well, and would be beautiful to serve next time you have guests over for a meal! I did not have a pretty platter to serve this on at the beach house, but a”vintage” Pyrex dish did the trick. Place a generous layer of mixed greens on the bottom of the platter. Drizzle with a little olive oil, balsamic, and some salt and pepper. Layer the tomato slices, leaving room in between the slices for the basil and cheese. Add the basil leaves between the tomato. Then add the burrata next to the basil, under the next tomato slice. Tomato – Basil – Burrata. Drizzle the salad with a little more olive oil, and some balsamic. Crack some black pepper and sea salt over the top. Serve and enjoy! (This is best served right away or within a couple of hours). I also made this quick dinner for Todd and I one night, using the leftover burrata. Scrambled eggs with spinach, served over sliced tomato and avocado with himalayan pink sea salt. (You could use regular salt!) We added the burrata on top. so.dang.good. Brunch for dinner! Holy moly. It has been one hell of a week! And I am honestly glad it’s coming to an end. If you saw my post yesterday, you already know that we had a yucky house problem occur on Monday. It isn’t fixed yet, but we have gotten some answers, and we have calmed down about it. Trying to dwell on happier things! Like lots of beauty tips and lovely things, apparently. I’ve got 6 things today…had to throw in that great find from H&M at the last minute! ONE: I found some new goodies at Sephora recently, and had to share of course! Truth be told, I do not wear make up every day. Who has time, right?! But I do feel better when I love my makeup. I had been using the same eye pencil for a good 6 months and wanted a change. This Sephora brand eyeliner is far better than any eyeliner I’ve bought in a while. It is a saturated color, easy to apply, and it stays put. I bought it in Deep Brown. I also really love this finishing powder. I was advised to buy the Laura Mercier brand, but this is a much more affordable alternative, and I’ve really enjoyed it. It keeps your face from looking too shiny by the end of the day. I also was in need of some new perfume, and decided to use a gift card that my in-laws gave me for my birthday. In December. :) I picked Tocca Simone mainly because the scent was described as beachy and light. The pretty bottle, and the fact that it wasn’t crazy expensive helped convince me. The perfumes on my wish list are over $100, but I wasn’t ready to spend that! TWO: I tend to get my waves too curly, and they typically look better the next day. But with this Flat Iron Wave Trick from The Beauty Dept., I think I can make them look more natural the first time I try! I like to add waves to my hair with a curling iron, and this trick suggests that, but then going over it slightly with a flat iron. If you read the tutorial and try it, too, let me know! THREE: This necklace from Tealhouse Collection is on my wish list. I rarely go for statement necklaces, but this one immediately caught my eye! FOUR: I know I mentioned this recently, but did y’all know that Ray Bans are still on sale?! Oh how I wish I’d known when I bought mine (for full price, bummer!). I have grown to really love my aviators, and am so pleased with the purchase. If you’ve been wanting some for Summer, now is the time! Plus Mother’s Day is in a few weeks…hint hint, husbands! FIVE: Today is Earth Day! I am not the greatest at being environmentally conscious with everything, but I do love buying from local farms. And you all know how much I enjoy cooking with plenty of vegetables! Today and tomorrow are great times to seek out some local produce at your neighborhood farmers market. I have recently purchased eggs, produce, and plants from the Waxhaw Farmer’s Market, at well as the Kings Drive Farmer’s Market. Here is a list of markets in and around Charlotte. These are the ferns I bought for our front porch this week. SIX: A few weeks ago my mom was placing an order from H&M, and she asked if I wanted anything. We were aiming for a large joint order and free shipping! I ordered an off the shoulder blouse and this t-shirt. I have worn it twice this week with white jeans, and I have gotten several compliments and people asking me where it is from! It is a simple, loose-fitting, long black t-shirt, but it’s great! I bought a size up to fit my bump for a while, but ordinarily I would’ve bought my regular size. For $9.99, I highly recommend it! Have a great weekend! Thank you for stopping by! I am off to the gym with my neighbor bright and early today. She is a former personal trainer and has been keeping me active lately – when I truthfully haven’t felt like it. So thankful for her! Broken record over here, I know, but we love Topsail Island! It is a home away from home for us, and we were so happy to share a weekend there with some of our closest friends! We always have a good time together, and it was fun to have our boys join us for this trip. We played on the beach, and the boys didn’t seem to mind the colder weather too much. I did, though. (I am a wimp)! We stopped at the new favorite donut shop in Surf City – The Fractured Prune – on our way to explore “The Point” at the end of the island. On our last night we took the boys out for seafood. One ended up with a spilled drink in his lap, and the other was standing up in his chair and lifting up his shirt to show us his full belly. But we had a blast! We tried to get a picture of all the matching chambray boys. They were so into it – ha! Our attempt at bump pictures was kind of ridiculous, but I love them. Don’t we look like naturals?! I will be back tomorrow with some Friday Favorites! I hope you all have had a great week! 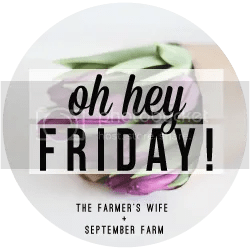 Today I am linking up with April, Natasha, and Christina; Karli; Erika, Narci, and Andrea for Five on Friday, Oh Hey Friday!, and Friday Favorites. ONE: Back to Topsail this weekend! With the Honor Roll Designs crew and our little boys! Thank you to our awesome employee/brother-in-law, Seth, for holding down the fort while we’re gone! Last year we took a big trip to the Caribbean, but with babies on the way for both of us, we at least wanted to fit in one weekend away together before the newborn stage. Love these 3 people so much! TWO: I posted 2 new recipes this week: Sparkling Pineapple Mint Meyer Lemonade and Apple Rosemary Grilled Pork Tenderloin. If you missed them, you should check them out! They are both perfect for entertaining. THREE: Self-tanner review! I posted about the Fake Bake Flawless tanning system a few weeks ago. (The link takes you to a seller on Amazon…Prime eligible and only $15!). You can also find it here and probably find a discount code, if you aren’t a fan of Amazon. I used it once after I bought it and immediately loved it. Then I used it again this week, and I am still loving it. If you’re looking for an inexpensive, at-home tan, this is the way to go! Without a doubt. It comes with the mitt, so don’t worry about getting it all over your hands! I do have to say – this time I put on clothes and got in bed soon after applying…I woke up with a streak on my arm and my leg, BUT, the streaks came right off with a quick rinse in the shower. Next time I will be sure to let it completely like I did the first time. And it is washable from your sheets and clothes. FOUR: If you’re in an area, such as Charlotte, Fort Mill, Charleston or Nashville, with a Juice Bar, I highly recommend trying it! Last week I got their Sweet Greens juice, and it is unbelievably good – and healthy! And I really am not a big green juice person. If this spot was closer to my neighborhood, I might be there every day. Juice > Starbucks…yeah?! By the way, my aunt and my mom introduced me to Essie Ladylike (on my nails in the picture above) and it is definitely on my to-purchase list. Happy weekend to you all! Thank you for visiting this random space of mine that I enjoy so much! I love and appreciate all of the comments and feedback and friendships made from blogging.